This morning, we finally got to wave goodbye to the Dome A traverse team of 28 men. 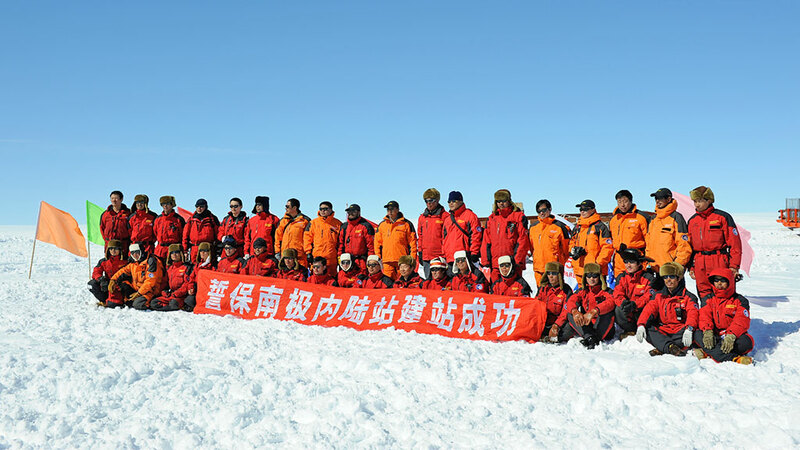 After six weeks of immersion in the 25th Chinese Antarctic Expedition and the emotional speeches and storytelling at the banquet the night before, it was very moving to witness the spontaneous outburst of hugs and tears as old friends and new bid farewell to each other on the edge of the ice sheet. Blue sky and no wind. After a brief ceremony, only the deaf silence of Antarctica could be heard as those left behind watched the expedition drive over the horizon, then reappear a little further and disappear again as it made its way south across the gentle undulations of the ice sheet: A slow-moving caravan of 11 snow tractors pulling some 40 sledges loaded with food, fuel, living trailers, and construction materials for Kunlun Station. Getting to this stage hasn't been easy, and that's an understatement. In the end, the Xue Long didn't get any closer than 28 kilometres from Zhongshan Station. All the cargo for the Dome A traverse, including building materials for the new station and the three older and lighter-tracked vehicles had to be airlifted by helicopter over to the traverse starting point, some 10 kilometres inland from the station. Completing this task required a huge effort on the part of the helicopter crews. The only things taken over the sea ice were the two remaining Piston Bully 300s, like the one that dropped into the sea a few weeks back (and which are too heavy to airlift). But this was only done after some more careful testing and marking of the route with the help of Russian sea ice experts from Progress II Station. Then began a week-long effort of loading the sledges whilst (in a change of plan to make up for lost time and lighten the initial departure load), some tractors and sledges where used to lay fuel depots as far as 250 kilometres inland. Lead by Mr. Li Yuansheng,the traverse team consists of one vice-leader, one navigator, one communication expert, four mechanics, two doctors (one of them a special high-altitude doctor from Tibet), one cook, a two-man TV crew from China Central TV (CCTV), two construction managers, twelve builders, and one astronomer in charge of the overhaul of the PLATO Observatory. Almost all of them will share the driving over the next twenty days or so, as they travel some 1,220 kilometres inland to the culminating point of the East Antarctic Ice Sheet at an altitude 4,094 metres. Moving at an average speed of less than 10 kilometres an hour, they will encounter fields of very hard sastrugi (ridges in the snow carved by the wind), which can rise to more than one metre and make any advance very difficult and uncomfortable. They will also come across crevasse fields, which fortunately have already been surveyed and marked during previous expeditions. During the traverse, the team will only stop for a maximum of eight hours per day, and sleep and eat in just six specially-fitted containers, one of which is the generator and toilet, two of which are kitchen and eating areas, and three of which are sleeping accommodations. Because they were late in leaving, Mr. Li now hopes to arrive at Dome A approximately between the 8th to the 10th of January, some ten days behind schedule. As a result, it is likely that their stay at Dome A will be reduced from the originally planned 30 days to not much over 20. Not only must they head back to Zhongshan Station to catch the ship back to China, it also becomes very difficult to stay at Dome A and work outdoors later than the end of January. From the beginning of February, temperatures start to plummet to below -50°C. Although the plan to complete phase one of the construction of Kunlun Station's main building this season remains unchanged,the shorter stay at Dome A will clearly increase the pressure on the construction team and support personnel, and completing their mission in time will require working extra long hours in extremely demanding conditions. The plans for Kunlun Station have evolved somewhat since the publication of the Draft Comprehensive Environmental Evaluation (CEE) report in January 2008. In order to reduce construction time to a minimum, the main building has been designed for easy assembly and consists of 17 assembly kit containers ready-fitted right down to the beads, carpet, and door handles. This year's first phase of construction will consist of assembling the 11-container living and working unit of the building, or 160 m2 of sleeping, eating and working space. Next year, the second phase of construction will see the addition of the six-container, 70 m2 technical wing, which are to include generators, a water treatment plant, workshops, and storage space. Both units will be connected and built on a single elevated platform measuring some 280m2, which will also include two exterior balconies for instruments and operations. Even though precipitation is minimal at Dome A, the platform will be raised on stilts with wide bases so as to prevent the station from sinking into the snow. In front of the station two large traditional and commemorative bronze tripods weighing two tons each will be placed. The first is being transported to Dome A this year, and the second will be transported next year. In the coming years, Kunlun Station will also see the addition of more buildings, including a garage and workshop unit, an autonomous emergency shelter in case of fire in the main building, and an ice coring drilling and storage unit. Although first intended as a summer only station operating on jet A-1 fuel, the five to ten-year perspective is to deploy a solar panel array as a supplementary power source and to eventually have the station operational all year. Once their work is complete, the traverse team will enjoy travelling back to Zhongshan Station carrying a much lighter load consisting only of necessary fuel, the living and sleeping containers, and empty sledges. But even if this enables them to travel much faster,the return journey is expected to take as many, if not more days then the outgoing one. This is because the traverse will stop at regular intervals to carry out scientific work including the collection of surface ice samples, GPS and surveying work to measure ice sheet movement, and atmospheric work within the context of China's lead International Polar Year (IPY) 2007-08 programme, PANDA. In addition, the traverse team will be pick some 22 tons of empty fuel drums from one of two aircraft refuelling stations established on the East Antarctic Ice Sheet by the very important IPY project AGAP (Antarctic Gamburtsev Province), which this summer is using airborne instruments to survey the ice sheet and bedrock topography in the Gamburtsev region. After a gruelling two and a half months spent on the ice, the traverse team aims to be back at Zhongshan Station at the end of February, giving them a week to ten days before the ship departs. This will give them enough time to service and winter tractors, sledges, and other equipment in preparation for next year's expedition - and also to enjoy a well-earned hot shower! From the beginning of February, temperatures start to plummet to below -50°C (at Dome A).